Vensim Model Reader allows you to save scenarios (model runs) under different names. Multiple scenarios can be loaded by Vensim Model Reader at the same time, and output from each loaded scenario will be included on graphs and in tables of results. If you perform simulations using the “Sim Setup” and “Simulate” buttons, the process for creating multiple scenarios is very straightforward. Simply edit the name in the “Simulation results file name” control before pressing the “Simulate” button. Results will be saved to a new .vdf file with that name. If you perform simulations using the “SyntheSim” button, the process is more complex, because you can create an unlimited number of scenarios during the same SyntheSim session. At the time you push the “SyntheSim” button, and while you change the sliders on the “Policy Control Center” sheet, no scenarios will be saved to the model folder. Vensim will wait until you exit SyntheSim mode (by pushing the “Stop Setup” button) before writing any .vdf files. During the SyntheSim session, you may change the text in the “Simulation results file name” control. Each time you change the name, Vensim remembers the values that all variables had at the time you changed the name and assigns those variables to the name that was in the “Simulation results file name” field before the change. When you are ready to stop using SyntheSim mode and press the “Stop Setup” button, Vensim assigns the current variable values to the name that is then in the “Simulations results file name” field. Then it will create all of the .vdf output files at once. Therefore, in order to create multiple scenarios, the correct procedure is to set the name you want, then set the controls for that scenario, then set the name you want for the next scenario, then set the controls for that scenario, and so forth. For example, before pressing the SyntheSim button, I change the “Simulation results file name” to “CarbonTaxOnly.” I enter SyntheSim mode, then set the “Carbon Tax” lever to a non-zero value. 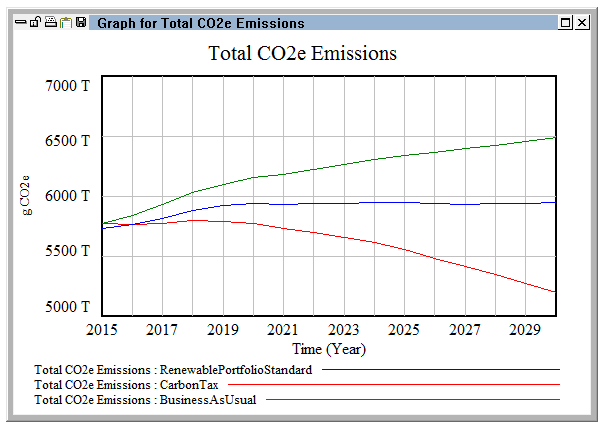 Then I change the “Simulation results file name” to “RenewablePortfolioStandardOnly.” I set the “Carbon Tax” lever back to zero, then set the “Additional Renewable Portfolio Std Percentage” lever to a non-zero value. Finally, I change the name in the “Simulation results file name” field to “BothPolicies.” Now I set the “Carbon Tax” slider to a non-zero value, then push the “Stop Setup” button. Vensim writes three output files: one with each of my chosen names, containing the associated policy settings and results. Select the “RenewablePortfolioStandard” scenario and click the “«” button in the column between the “Available” and “Loaded” panes. The “RenewablePortfolioStandard” scenario moves to the “Available” area and is no longer loaded. It will not appear on charts or tables generated in Vensim. However, the data file, “RenewablePortfolioStandard.vdf,” remains in the model folder until it is deleted or overwritten. It can be moved back to the “Loaded” pane by pushing the “»” button, and it will again be included in graphs and tables.